Save over 30% and get the BLENDS LOGIC TILE CARD BUNDLE! “R” Blends Logic Tile Cards are a fun, hands-on way for students to learn and practice reading/spelling common words beginning with “R” blends. 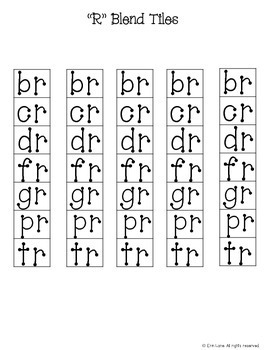 These tile cards will challenge students by having them use their logic and spelling skills to complete a variety “R” blend words, using seven “R” blend letter tiles (included in this file). Students have to manipulate the blend tiles on each card, until they get seven correct words. Some cards can have words where multiple blend tiles can fit in one word (i.e. ______own can be “crown”, “frown,” or “drown”), so students will be challenged to use their problem solving skills to figure out which blend belongs in a particular box based on reading the other words on the page. 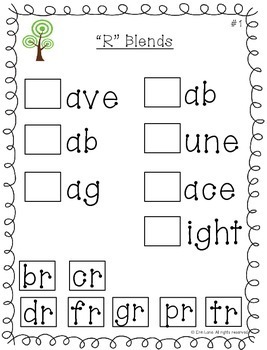 Students place the blend letter tiles on the “blend place mat” at the bottom of each tile card before beginning. This is a great time to reinforce and practice the sounds that all of the blends make. This center can also be done with a partner, where students take turns trying to complete the seven words on the tile card together. 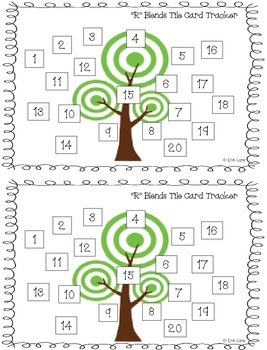 Students are able to see their success in working through these tile cards, as they keep track using their own Tile Card Tracker (also included in this file). Once a tile card is completed and checked by the teacher, students get a “star” on their Tile Card Tracker and they are allowed to choose another card to complete. Logic Tile Cards make a great center activity, either for small group, or independent student practice. Directions are included with each set, so parent volunteers can easily run a tile card center too. Once students get the hang of how to complete a tile card, this becomes a fun and easy go-to center for students! 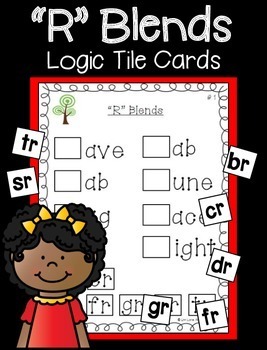 “R” Blends Logic Tile Cards were created for first grade students learning to read. However, these tile cards can easily be adapted for advanced kindergartners or for second graders needing extra support in language arts. A BLEND BUNDLE SET is available in my TpT store! If you are looking for more of a reproducible activity, rather than a center activity, you can check out my “R” Blends Interactive Logic Book! R Blends Tile Cards by Erin Lane is licensed under a Creative Commons Attribution-NonCommercial-NoDerivs 3.0 Unported License.